Recycling is always a good idea but when it comes to appliances, it's a must. 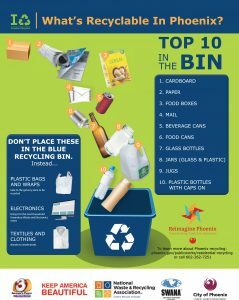 Recycling is not just for tree-hugging hippies, it's for all of us. Our blue bins make recycling some things convenient such as junk mail and beer cans, but when it comes to tricky stuff like appliances you may find yourself wanting to just chuck the hassle away. 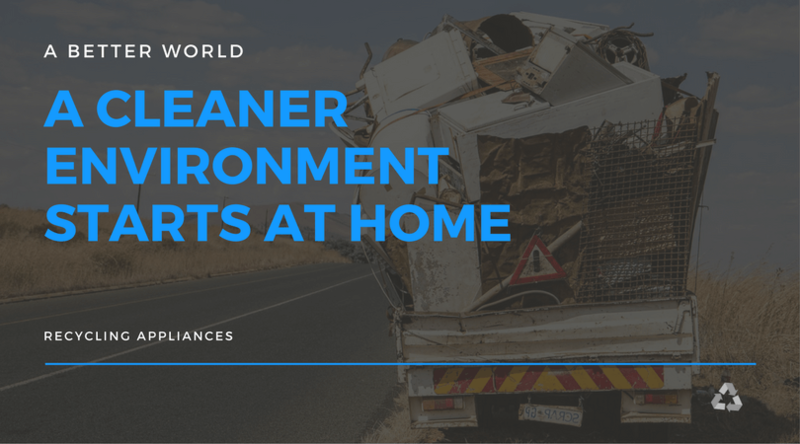 But the benefits of recycling an old appliance are significantly more than just recycling your junk mail. That means that you need to put in a little more effort. First, unlike day to day items, almost all appliances can be recycled. It's not like looking at an empty pizza box and trying to puzzle out the conundrum of how a little grease means an entire cardboard box has to go in the trash. Just like cardboard, old appliances should be recycled. If they are still in working condition consider donating them, but once they have died their last death it's time to recycle. 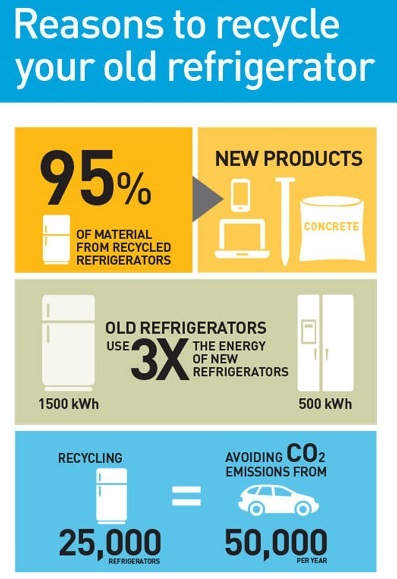 Most refrigerators have about 98% of recyclable materials. In man terms that means for every 100 hundred women you hit on in the bar, 98 of them say yes.It's not just your run of the mill recyclables either, sure there is metal, but there is also plastic, glass, compressors, motors, thermostats, and polyurethane foam.There is a lot of metal in there. Any fridge older than 10 years has about 120 pounds of recyclable steel.That's enough to make Iron Maiden jealous, so don't let it go to waste. If you get lucky you might even make a few bucks depending on how much metal a recycle center can get out of it. It's not all rainbows and sprinkles though. Appliances like air conditioners and refrigerators use Freon to keep things cool. This is a nasty chemical that can seep into the air and rise all the way up to the ozone causing serious damage. Basically, Freon is the Herpes of the Earth. Don’t let it spread. We are all tree huggers, or we should be, even if it is in a deep secret place inside of us because throwing out an old refrigerator is dangerous. And not just because of TTDs (Trash Transmitted Diseases) like Freon. There are a lot of viruses such as CRC-11, it's just foam insulation, but it emits a destructive gas and as it erodes it oozes carbon dioxide. Besides the Herp, refrigerators have other chemicals like mercury and oil. But if you recycle the fridge you don’t have to be the one who worries about where to put all of the diseased ridden fluid. You get to comply with federal law, by making compliance someone else's problem. Unfortunately, some cities in the Valley charge a small fee to pick up old appliance curbside and take it to a recycling station. However, it's a small fee, just skip your mocha latte today. Do it for your kids. Or if you do a little research, you can probably find a program that will offer you a little something if you recycle. Some programs will pay as much as $50, that's a lot of lattes.